From the beginning of our country’s history one group of professionals has always stood ready to protect and serve citizens from those who would do us harm, to defend the “Thin Blue Line”. In their honor, Wellington LTD is proud to introduce a this unique collectible handgun, the “Thin Blue Line” special edition! Wellington LTD is proud to present the General William O’ Darby Special Edition. This beautiful custom handgun is crafted as a tribute to the life and history of General William O’ Darby and the formation of the U.S. Army Rangers. Available in the legendary Remington R1 45. cal. semi-automatic pistol, with engraved ivory grips and gold highlight. Banners on the frame pay tribute to General Darby &the U.S. Army Rangers motto and beliefs. To see more details of our General William O'Darby 45 caliber Remington custom handgun please click here! A tribute to the history and people of the State of Arizona in its centennial celebration, the Arizona Centennial Special edition collector revolver is available in the legendary Colt 1873 .45 caliber revolver, the engraved artwork is defined in 24-karat gold and jewelry-grade nickel. Banners on the frame pay tribute to the Sonora Mining &Exploring Company and the Maricopa &Phoenix Railroad. Laser engravings on the pistol grips honor the U.S.S. Arizona and the Prescott Courthouse. The Arizona State flag is highlighted in copper making this edition a unique, fully functional, work of art. To see more details of the Arizona Centennial Special Edition Revolver please click here! Crawford County, Arkansas Collector Grade Ruger Superblackhawk .44 mag. 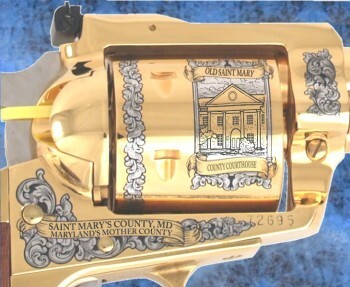 St. Mary's County Special Edition Collector Grade Revolver - Ruger Superblackhawk .44 mag. From the beginning of our country’s history one group of professionals has always stood ready to protect and serve citizens from those who would do us harm, to defend the “Thin Blue Line”. 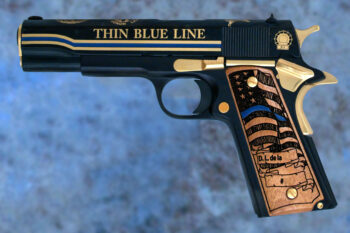 In their honor, Wellington LTD is proud to introduce a this unique collectible handgun, the “Thin Blue Line” special edition! Wellington LTD is proud to present the General William O’ Darby Special Edition. 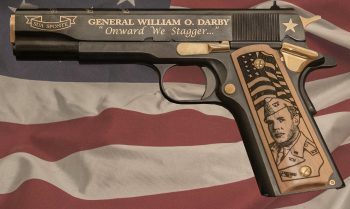 This beautiful custom handgun is crafted as a tribute to the life and history of General William O’ Darby and the formation of the U.S. Army Rangers. Available in the legendary Remington R1 45. cal. semi-automatic pistol, with engraved ivory grips and gold highlight. Banners on the frame pay tribute to General Darby & the U.S. Army Rangers motto and beliefs. To see more details of our General William O’Darby 45 caliber Remington custom handgun please click here! A tribute to the history and people of the State of Arizona in its centennial celebration, the Arizona Centennial Special edition collector revolver is available in the legendary Colt 1873 .45 caliber revolver, the engraved artwork is defined in 24-karat gold and jewelry-grade nickel. Banners on the frame pay tribute to the Sonora Mining & Exploring Company and the Maricopa & Phoenix Railroad. Laser engravings on the pistol grips honor the U.S.S. Arizona and the Prescott Courthouse. The Arizona State flag is highlighted in copper making this edition a unique, fully functional, work of art. To see more details of the Arizona Centennial Special Edition Revolver please click here! Considered by military historians to be one of the most gifted tactical commanders in United States history, Stonewall Jackson is probably the most well known Confederate commander second only to Robert E. Lee. His Valley Campaign and his envelopment of the Union Army right wing at Chancellorsville are studied worldwide even today as examples of innovative and bold leadership. Collector Grade Ruger Superblackhawk .44 mag. This is an American made Collector’s Grade Ruger Superblackhawk in a .44 mag. caliber, fully plated in 24-karat gold and richly engraved with images and banners honoring among other things Crawford County’s Historic Courthouse, Deputy U.S. Marshal Bass Reeves, the Battle of Van Buren, and the Old Frisco Railway and Depot – all taken directly from Crawford County’s storied past. ACT NOW! French-fitted cases are available for this edition. Collector Grade Revolver – Ruger Superblackhawk .44 mag. Saint Mary’s County, MD – Maryland’s Mother County. The settlement of Lord Baltimore’s Maryland began with the arrival of passengers from England at St. Clement’s Island in the Potomac River in what is now southwestern St. Mary’s County on March 25, 1634 (the anniversary of this landing being annually celebrated as Maryland Day). The passengers arrived in two vessels, the Ark and the Dove, which had set sail from the Isle of Wight on November 22, 1633. Among other firsts, St. Mary’s was the first county established in Maryland, in 1637, probably by an order of the Governor and is also home to the first Catholic Mass celebrated in the original thirteen colonies. In 2008 the county seat, Leonardtown, celebrated its sesquicentennial anniversary. In honor of the Sullivan County Sheriff’s Office 255th Anniversary Wellington LTD, in collaboration with members of the Sheriff’s office, presents the Sullivan County Sheriff’s Office Special Edition. This special edition is a beautiful tribute to all the members of this office, their families, and friends.